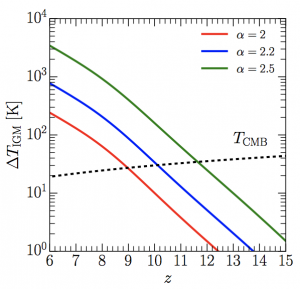 Title: Do Cosmic Rays Heat the Early Intergalactic Medium? Cosmic rays are those really cool high energy particles you may have heard about. They stream from beyond our solar system into our atmosphere causing cascades of even more particles. The source of these very high energy charged particles was for the longest time unknown. It wasn’t until recently in 2013 that the Fermi Gamma-ray Space Telescope was able to constrain the source of some cosmic rays to supernovae (SNe). While we can experience cosmic rays very locally in our atmosphere, they very well may have had an impact on larger cosmological scales in the form of heating the intergalactic medium (IGM). The IGM is the huge voids between galaxies that are filled mostly with some state of hydrogen. Just like cosmic rays, the high(-ish) redshift universe still has a ton of uncertainties. In the context of the author’s work, high redshift refers to the period around the beginning of the epoch of reionization (EoR). The EoR is the point sometime between the Dark Ages and redshift z=6, when the neutral hydrogen in the universe was reionized by the UV radiation from the earliest stars and galaxies. To understand the physics going on during the EoR it’s helpful to know certain properties of the IGM. But why is knowing the initial temperature of the IGM important? Well because this period during the early stages of the EoR can also tell us a lot about how the very earliest galaxies formed, and the conditions for the beginning of reionization. Figure 1: The ionization rate of the IGM over redshift. The 3 different cosmic ray source spectrums ( ) are all orders of magnitude well below UV radiation showing that we can pretty much rule them out as an ionizing source. 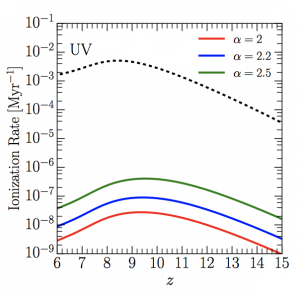 The sources of reionization are fairly well understood to be UV radiation from early stars and galaxies, while potentially being supplemented by some more exotic sources. Cosmic rays were initially approached as being one of these potential exotic sources for reionization. But as we can see in Fig. 1 cosmic rays are shown to have an ionization rate well below the UV ionizing rate. The cosmic ray ionization rate depends on the energy spectrum of cosmic rays ( ), as this determines how much energy goes into ionization. This is related to the Fermi acceleration of the protons from the SNe emitting the cosmic rays. Which for our purpose here is just a fancy way of saying that the cosmic rays have a characteristic set of energies. Where cosmic rays can still contribute is by heating the IGM. They however have competition, as X-rays have been thought to be the go to source for pre-heating the IGM. X-ray heating is proposed to preheat the early IGM to temperatures of around 100K at z=10, however the early X-ray universe hasn’t been properly constrained. This uncertainty in the amount of early X-ray sources gives our authors here a chance to explain how cosmic rays could have been a contributor to heating the IGM. Figure 2: IGM temperature over redshift as it responds to differing cosmic ray source spectrums ( ). Looking at z=10 we can see that the = 2.5 cosmic ray spectrum heats the IGM to temps beyond what potential X-ray heating can. The authors begin by constraining the cosmic ray production by using that the cosmic ray energies and populations are dependent on the star formation rate (SFR) and the supernova (SN) rate per solar mass. They additionally neglect Pop. 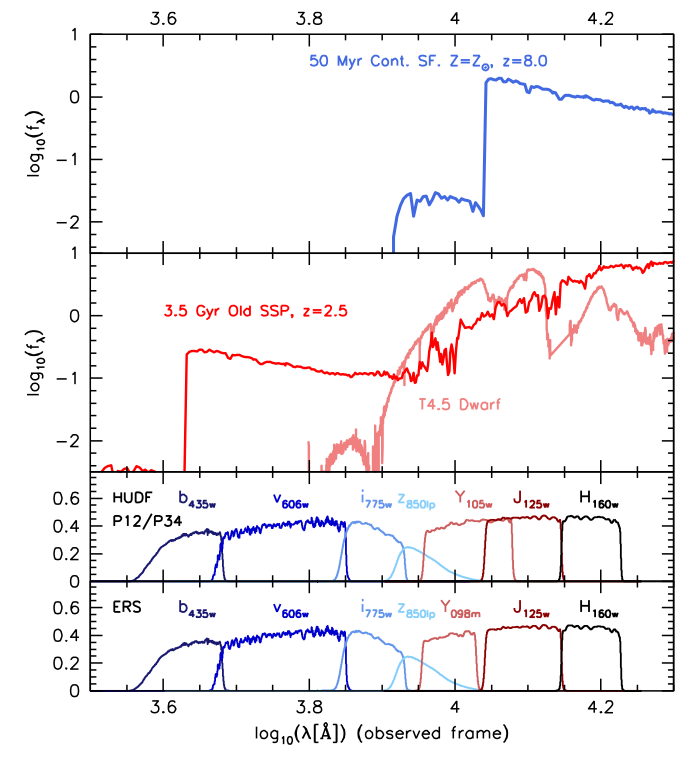 III stars as sources because they are not well understood. The author’s results of cosmic rays as a competing heating source is seen in Fig. 2 as compared to the cosmic microwave background (CMB) temperature over redshift. They do stress that while at redshift z=10 the IGM can be substantially preheated to ~200K, how well the cosmic rays can heat outside of the forming galaxies is highly dependent on their diffusion. These high energy cosmic rays pass through the locally ionized hydrogen and free electrons causing a current and in turn magnetic fields. As you may remember from your E&M course, when charged particles move through a magnetic field it puts a force on these cosmic rays. The magnetic fields generated however are turbulent and this could make cosmic ray diffusion very difficult resulting in them not being able to contribute to IGM heating. Luckily in the near future we’ll be able to solve what actually heated the IGM by direct observations. When the next generation of radio telescope arrays are able to observe the beginning of the EoR, the contributions from X-ray heating or cosmic ray heating should ultimately leave a different fingerprint. I'm a 5th year PhD student at Brown University studying the early universe through the 21cm neutral hydrogen emission. I do this by using radio interferometer arrays such as the Precision Array for Probing the Epoch of Reionization (PAPER) and the Hydrogen Epoch of Reionization Array (HERA). 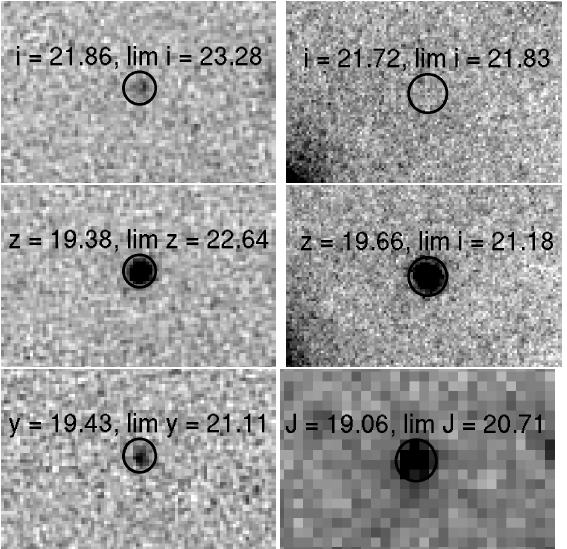 A Galactic-Scale Disappearing Act: Lyman-Break Galaxies at z ~ 8-9 The First High Redshift Quasar from Pan-STARRS Did stripped stars re-ionize the Universe? How did the Universe cool over time?